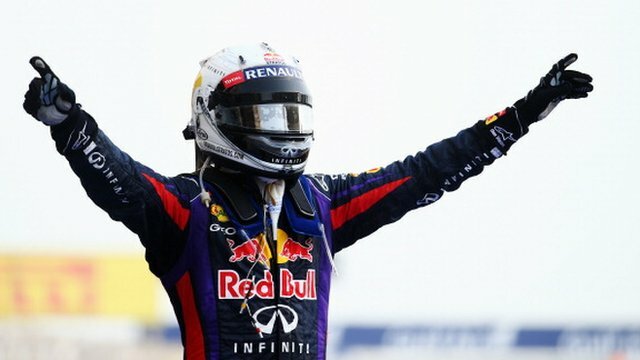 Sebastian Vettel cruised to his second win of the season as he romped to victory in the Bahrain Grand Prix. After losing second to Fernando Alonso at the start, Vettel produced a stunning overtaking manouevre to reclaim second at turn five on the opening lap, before passing polesitter Nico Rosberg on lap three to take a lead he never looked like losing. Kimi Raikkonen came second after using a two-stop strategy to come through the field, while his Lotus teammate Romain Grosjean took his first podium of the season by finishing third, passing the Force India of Paul di Resta in the closing stages of the race. di Resta’s fourth place underlined the improvement Force India have made over the winter, whilst Lewis Hamilton, the hugely impressive Sergio Perez, Mark Webber and the luckless Alonso, who had to pit twice in the opening laps after his DRS got stuck open, rounded out the top eight. Poleman Rosberg and Jenson Button completed the points, with both struggling to preserve their tyres throughout the race and the pair had to make four stops to get to the end. Everyone got away cleanly at the start, with Rosberg making it to the first corner from pole position, ahead of the dicing Alonso and Vettel. Alonso made it out of turn three in second place, but Vettel then used his KERS to great effect on the exit of the fourth corner to blast up the inside of the Ferrari and reclaim his starting position in brilliant fashion. Now into second place, Vettel clearly had more pace than the Mercedes of Rosberg, and having spent the whole of the second lap threatening a pass, pulled off a move at turn six on lap three to move into the lead. Alonso then waited his turn behind the Mercedes, and with the help of the DRS made his move on Rosberg to take second at the start of lap five. However, in passing the Mercedes the Ferrari’s DRS had failed, and the flap on the rear wing of Alonso’s car jammed open, contravening FIA regulations and forcing him to pit on lap seven to get it fixed. That pitstop dropped the Spaniard way down the order, and instead of hunting down race leader Vettel, he was now staring at the gearbox of Jules Bianchi’s Marussia. He used the DRS to pass the Frenchman into turn 11, but as he did so the Ferrari’s flap stuck open again, forcing a second visit to the pits in as many laps. With the use of DRS not an option for the remainder of the race, Alonso was forced to make his way through the field without the use of his main overtaking aid, but creditably fought back into the points in the closing stages. He passed Perez to take seventh place, but with no way of using his rear wing to make inroads into the scrapping Webber and Hamilton ahead of him, he became easy prey for the McLaren in the closing laps and the Mexican retook the place to leave Alonso in a still very respectable eighth. Perez was one of the standout performers of the race. Having received plenty of criticism over his racecraft since his move to McLaren, he got himself into some cracking battles for position throughout the race, most notably with teammate Button in the second and third stints. The pair made contact on more than one occasion as they fought wheel-to-wheel, and the Mexican got the better of his more experienced teammate, managing to complete the race on one less pit stop. A fine afternoon for Perez was completed on the final lap when he passed the Red Bull of Webber to take sixth place. Hamilton was another driver that fought through in the closing stages. The Englishman had endured a subdued afternoon up until the final round of stops and looked set for a place in the lower reaches of the points, but fought through in the closing stages to pass Perez and then Webber right at the end after a thrilling battle that lasted several laps. By now Vettel and Raikkonen were safely out front, and the big question was as to whether di Resta would be able to claim a place on the podium ahead of Grosjean, who had been forced to visit the pits on three occasions throughout the race. Having driven a storming race, undoubtedly the finest of his F1 career, it looked as though di Resta was set for his first ever podium finish, but the Lotus of Grosjean made a late charge on the medium tyres and with just five laps remaining, took the place from the Force India on the pit straight to take third place and ensure an exact repeat of the podium standings from last year’s race. But there was no stopping the dominant Red Bull of Vettel, who comfortably drove his car home to take his second win of the season. He now leads the world championship on 77 points, ahead of Raikkonen with 67, whilst Hamilton lies third with 50, three clear of Alonso in fourth place. 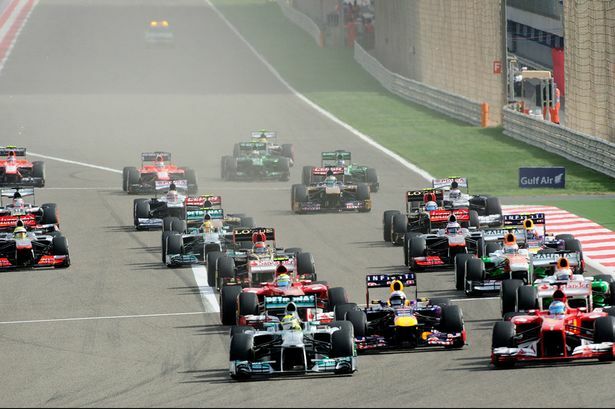 This weekend will see the ninth running of the Bahrain Grand Prix, a race that made history in 2004 when it became the first Formula One race to be staged in the Middle East, but also one that has attracted much controversy over the last few years. Without wanting to detract too much from the fact we have a race on this weekend, there are clearly a lot of people (both in Bahrain and around the world) that do not think this Grand Prix should go ahead for political reasons. 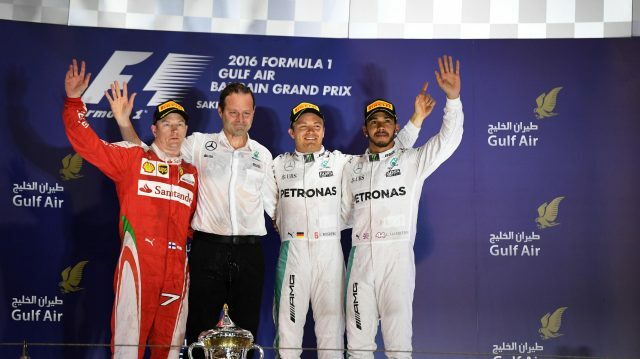 However, the race will go ahead as normal and the fact that there has been no further deterioration in the political situation in the Gulf state since last year’s event, which attracted just as much criticism, means that anyone lobbying for the Grand Prix’s cancellation this time around was as likely to be successful as a Jacques Villeneuve comeback bid. With that little titbit about Bahraini politics out of the way, let’s move onto the race. And it promises to be yet another exciting one after the three crackers we’ve had to start off the season. Lotus, Red Bull and Ferrari have all taken turns at the front in the first three races, and with Messrs Raikkonen, Vettel and Alonso all tasting victory so far we are almost halfway to a repeat of the electric start to last year’s championship, when seven different drivers won the first seven Grands Prix. However, with those top three teams looking more likely than anyone to take the victory this weekend, and those three teams all having established lead drivers, it’s quite likely we’ll be seeing that little run come to a crashing halt on Sunday. The big talking point last time out was the tyres, particularly the durability (or lack of) of the softer compound. With cars not being able to get more than five or six laps out of it in Shanghai, Pirelli have taken the last-minute decision to bring the medium and hard tyres to Sakhir, rather than the soft and medium rubber. Whether it’s a kneejerk reaction or not, or whether teams like Red Bull have coerced them into the unexpected change of heart is not yet known, but it’s definitely something that will delight a large section of the paddock who have become fed up with using tyres that don’t last. Will that decision affect the race? If anything, it’s Red Bull that will benefit the most from it. The team have struggled to make their tyres last as long as the Lotus and Ferrari on the longer runs so far this season, meaning they have been unable to unleash the full potential of their car. Therefore, compounds that last longer should help them out a bit in this respect and help them keep up. However, should these harder compounds have the effect of pushing the race into a borderline two or three stop race, it could be the Lotus, the best car on its tyres so far, that benefits from being able to run one less stop than its rivals and gains the most from it. All that, and much more, means we are set for a fascinating race on Sunday, and if the opening gambit of this season is anything to go by, we’re in for a treat in Bahrain this weekend. Designed by (you guessed it) Hermann Tilke and opened for business in 2004, the Bahrain International Circuit was one of the earlier tracks to be brought to the F1 calendar by the sport’s resident architect. With the exception of 2010, when what can only be described as the most boring section of track in the history of the F1 world championship was added to the circuit (and wisely removed just as swiftly), the race has been held on the original 3.3-mile layout. The track features a mixture of long straights and hairpins, meaning those with good traction and rear end grip should go well here. There are a couple of fast, sweeping bends that provide a good test of a car’s aerodynamics, but overall this is a track that plays into the hands of those with good mechanical grip. With several first and second gear corners the circuit is one of the harder ones on the calendar for braking, so its vital for the drivers not to get too trigger-happy with the left foot, or that could become a major concern later in the race if the brakes become too hot and the chances of a failure (never a pleasant experience at 200mph) increase. Now instead of talking through each part of the Sakhir circuit one-by-one (which isn’t the most exciting thing that’s ever been done), I’ve gone for something different this weekend. So, courtesy of Marussia reserve driver Rodolfo Gonzalez, here’s an onboard lap of the Sakhir circuit from practice earlier today.